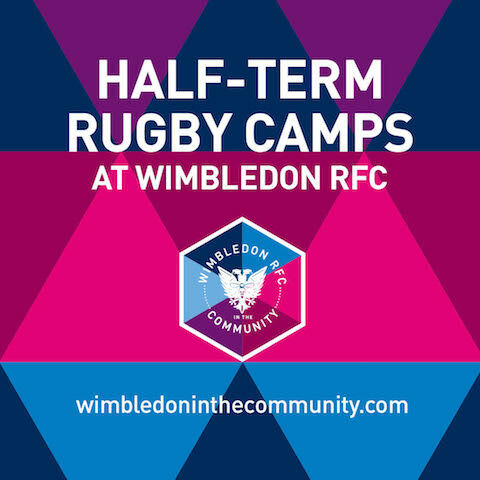 Our friends at Wimbledon in the Community are running a multi-sports camp at Wimbledon RFC in half term this Autumn. The clubs are aimed at u6s to u14s. 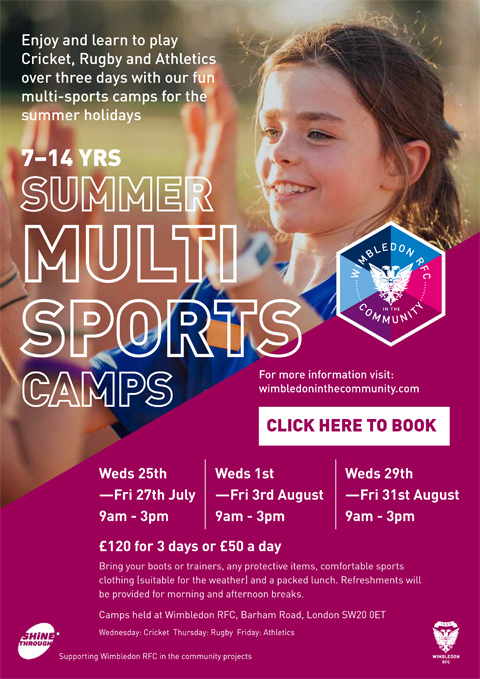 Primarily rugby based, the camps are three fun days of sporting activity, learning through games and skills with exercises for overall individual development. Activities that enhance agility, co-ordination, speed and balance will also be delivered. Don't miss this brilliantly-run clubs. The clubs run 9am until 3.30pm each day with drop-off from 8.30am and an after-club option (for a small extra fee) until 5.30pm. £75 for the three days. This Sunday is the last day to register for the season to benefit from early-bird subs rates. They go up from Monday. Go to get he How to Join page and follow the links. Apologies for the website outtage. Many thanks to Martin for sorting things out. Now the site is back up, here's the pitch plan. Given there's a match today (U15s), as well as everyone at home training, there's a few age groups moving around. 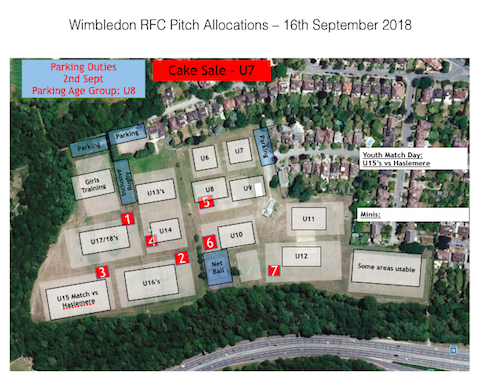 U8s on parking, u7s on cakes. We had a fantastic season-opener last week. Lots and lots of kids, brilliant weather, lush grass. The subs desks are in brilliant form, too, with over 180 families already signed up for the season. Please go and see Nick and team this Sunday in the clubhouse and get paid-up if you can. Full details of the new season and subs etc are below. Please respect our neighbours and follow our parking policy and all directions given by parents who are volunteering as parking marshalls. There's a second-hand kit sale and the clubhouse (with lots of second-hand boots as well). You can also try on sample sizes of new kit and order new kit as well. In other good news, the 1st XV rugby won their first match of the season against Tring last week. Welcome back all - new and old to the club. Full details of the new season and subs etc are below. There's a new shiny, tarmacked car park at the club house. When it's full... On the topic of parking, please respect the parents helping to manage this (U11s this week) and follow their instructions and our Parking policy: respect our neighbours and don't obstruct driveways, park on verges etc. Cake sales are the U10s. Here's to a wonderful season. There's 1st XV rugby this Saturday at the club. Tring are the visitors, 3pm KO. Welcome to the new rugby season! 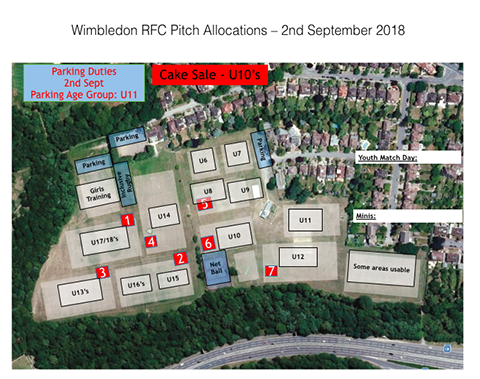 We look forward to welcoming all players back to Wimbledon RFC and hope to see some new recruits too. As South West London's biggest, friendliest rugby club, we welcome boys and girls from reception age all the way to U18. Boys and girls play together up to and including U11s, then we have boys squads to U18 and girls squads at U13, U15 and U18. We are proud to offer Inclusive Rugby for kids with SENs at no cost to play. Older rugby can be enjoyed at U21, four adult mens teams and a very successful womens team. We're chuffed to be able to support kids and families in our area achieve their rugby dreams. We welcome kids of all abilities and support England Rugby's Quilter Kids First philosophy. We're not tied to a specific school like some other local clubs and are thrilled that we have kids from over 100 different schools playing their rugby with us on Sundays. 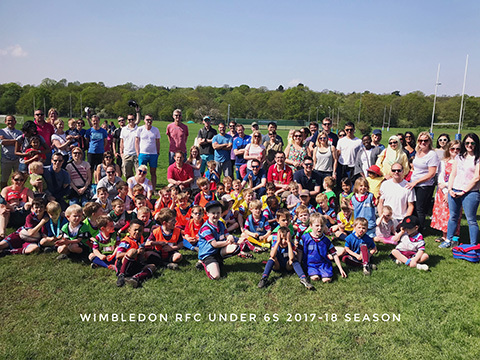 Wimbledon RFC is particularly popular with kids and parents from Australia, NZ and South Africa. Complete this online-submitted Google doc. Full details about membership on this page. You can see the regulations for each age group variations on this page. 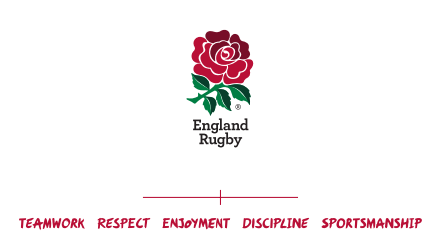 The full set of regulations on the England Rugby site are here. Youth fixtures (U12-U18s) have been re-organised so there's more purpose to the friendlies, triangulars and then the Waterfall tournaments through the season. 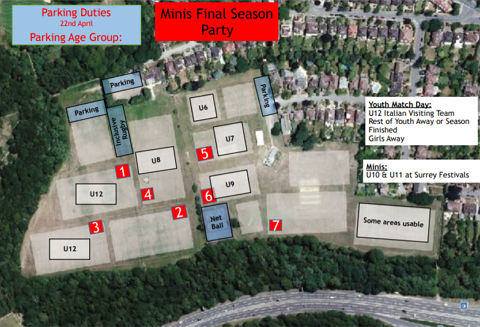 Minis fixtures (U7-U11s) are as brilliantly organised as ever. They will be updated on this site soon. The under 6s train at home all season as they get to learn and love our game. We are now open for new season subs and are running early bird offer on membership until 24th September 2018, holding the fees from last year. 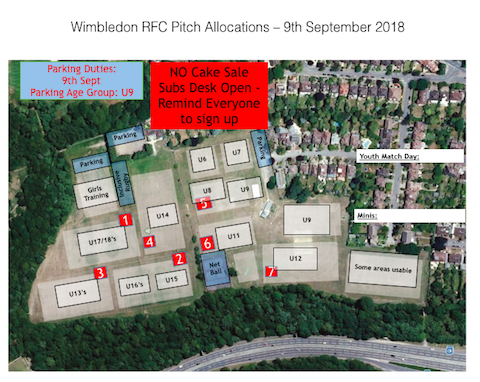 Whether you sign up now or at the clubhouse at the subs desks in September, whether new to the club or a longtime player, we look forward to seeing you at 10am on 2nd September. Please park according to our Parking policy. Specifically DO NOT BLOCK ACCESS TO RESIDENTS' PROPERTIES OR CAUSE BOTTLENECKS THAT COULD CAUSE AMBULANCES TO BE DELAYED. More details on how to join, about the club and links to England Rugby age grade information and coaching. At the beginning of the season it can take a few weeks for kit to arrive... so this year we are running a try-on and ordering day this Saturday (28 July 2018) at the club to try and improve things. We'll be there 10am to 1pm. Our kit people - Akuma - are sending through a set of sample clothing so you can try on before you order for the season ahead. Avoid the issues with ordering online! We will have order forms for each age group and then ask for either cheque on the day or they can transfer to club account. Try all your old kit on and bring along any second hand kit for the club to sell at the start of the season (clean please!). All funds raised from second hand kit sales go back to the club. Hope you are all having a wonderful summer so far. We’re enjoying the weather at the club at the moment! Just thought we’d let everyone know that we have just released our dates for our summer camps this year which we are very excited about! If you have any questions at all please let us know and we’d be happy to help! So at last, the season draws to a close. Hope everyone has had lots of fun. Youth are all away, other than U12s who are hosting the Italian team Petrarca Rugby (https://www.petrarcarugby.it/) - benvenuto! Each age group should gather, one at a time, on the lower patio (use the steps as a “stage”) for prize giving. Managers from each age group should keep an eye on progress and make sure their group is ready as soon as the previous one has finished. When not at presentations, each age group can be training. Food served from 11:30: if Inclusive and U6s go at that time, the other age groups can then follow afterwards. Rugby starts again 2nd September 2018. Have a lovely summer everyone.